A very interesting tour of Moscow's different periods of time, starting from the transition from Tsarist rule to the Soviet regime and until the present days of capitalism. 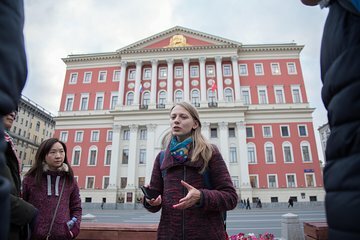 The tour emphasizes the contrasts, sometimes absurd, of the use of certain areas and buildings in central Moscow, throughout different times. What makes the tour particularly fascinating was the passion of our sharp and delightful guide, Irina, to her hometown and her sharing of her and her family's personal experiences in the extreme changing realities of life in Moscow. The tour is highly recommended for anyone visiting Moscow! Irina is very passionate about her country and it was really lovely to see that and hear all about the history. this tour is definitely worth attending. I loved this tour! Our guide Marina was extremely personable and was able to share some interesting anecdotes about living in soviet russia. The tour was very informative and wasn't too taxing, the walking helped us stay warm in sub-zero Moscow. One of the most fascinating stories was how the government modernised the city centre in the 30s without destroying any buildings - they cut their foundations and moved whole buildings on rails, with the people still inside, to allow the creation of the wide boulevards and roads in the city today. If you're curious about early soviet history, I'd definitely recommend this tour. The guide Ana was fantastic, really good English, very interesting information, very open for all questions, not rushed at all and besides the standard places also very interesting spots which you can not find yourselves! This tour was really good and I just loved our guides. They were adorable, engaging, sincere and funny! I really would have loved to just have lunch with them and talk about life in Russia etc. They were inviting and personable. You could see their love for Moscow and Russia and their true desire to share their country with you. I enjoyed hearing stories about their families and how communism affected them. They also pointed nice restaurants and markets along the way we tried one of each and they were great!. The only critique is that some of the stops were not really about communism. We really enjoyed the tour and company but don't expect that all stops will be about communism only. We started out across the street from the building that was the KGB headquarters in Soviet times. Our tour guide had excellent English and a strong passion for the subject matter. She showed us a building that was being renovated and was the place where 40,000 Russians were sentenced to death. She pointed out details about the different views of Soviet times among Russians. She recommended that we go to the Museum of Contemporary History we went there the next day that was helped to complete the overview of this subject matter. Excellent tour! I love history and I grew up in America during the 80s during the waning days of Communism, so this interested me from a personal historical standpoint. Our guide took us around Red Square and the area and discussed the uprising that brought down Russia's last tsar and ushered in Communism, Lenin and his views of Communism that were never quite realized and Stalin's terror that cost millions of lives. She pointed our several buildings that were central to Russia's Communist government, some still in existence in a government capacity, some now converted to other uses. This tour didn't bang the drum for Communism nor did it demonize it completely impartial. Just make sure you dress warmly for the winter because it's a night tour that takes place mostly outside!